Admittedly I'm map-obsessed. I use a variety of mapping technology for Compass & Key destination guides and itineraries, and I've tested virtually every app out there to recommend for our list of essential travel apps. Only recently did I stumble across an app from a Paris-based startup that is far superior to everything else we've tried and tested, especially for travel. You may never have heard of it, but I'm confident you will love it. Mapstr is an app that lets you create a personal map with all of your favorite places, anywhere in the world. Your map is always private unless you choose to share it with others. Essential Info: When you add a new place, Mapstr automatically links opening hours, contact information, and photos. So whenever you visit, you know when to go and what to expect. No More Lists: One of our favorite features is the ability to add notes about why you love the place or where you heard about it. Travel tips come from many sources, like the travel magazine article you just read, or your cousin who is always on the go, or the Instagrammer you follow. There's no need to keep endless lists or save restaurant business cards anymore, just add your places to Mapstr. Custom Tags: Categorize your places so you can easily reference them later with customizable tags. Do you love brunch? Magic shops? Rooftop bars? Create a tag. Add as many tags as you want to each place and filter your map by tags. Choose Your Transport: When you're ready to visit a place, Mapstr connects to a variety of transport options to get you there. Customize your preferred navigation within the app, including transit, driving, walking, and private hire (Uber). Import the Places You've Been: Mapstr connects to Facebook, Instagram, and other social sites to import the places you've tagged in your posts. You can also import KML files (the export format from your personal Google maps) and CSV files from any other lists. Just save the files to your phone (via DropBox, Google Drive, iCloud Files, etc.) and copy to Mapstr. Pre-Trip Planning: Use Mapstr to save all the places from your travel research, including restaurants, bars, shops, museums, markets, gardens, etc. Add a custom tag for 'must see' spots. When you're chatting with friends about your upcoming vacation, open the app to quickly save their recommended places without having to email yourself or add it to a list. Clusters of places will emerge, which not only helps you plan your time but also helps identify where you want to stay. Pro tip: make restaurant reservations by calling or clicking through to the website through the app. Group Trips: Instead of emailing back and forth when planning your vacation itinerary, share your Mapstr profiles with members of your group and create a custom tag just for your trip. Click 'add' to save spots from your group to your own map, and the spot is credited to the owner. You can also share a specific spot via text or email. During Your Vacation: For the places you definitely don't want to miss, select the bell icon and an alert will pop-up on your phone when you're nearby, regardless if Mapstr is open. Quickly add recommended spots as you chat with locals and fellow travelers. If you're looking for things to see and do in a new area, select the 'around you' option for some ideas. As you visit spots, update your Mapstr notes with impressions. Post-Trip Sharing: Inevitably friends and family request a list of recommended places after your vacation. Sharing your Mapstr profile allows them to save your spots to their own personal map. As you look back on your trip, Mapstr is also a handy way to remember where you went and what you did. FOr my Cape Town trip, I looked for hotels around the places I wanted to visit. Here I'm texting a highly-rated restaurant, Chef's Warehouse, to my friend. An alert popped up as I walked a block over from this Cape Town restaurant. Does it Work Offline? Yes, for accessing your existing map. To add a place, it's best to be online so that Mapstr can access its various databases to find the place and autofill relevant information, including address, hours, and photos. 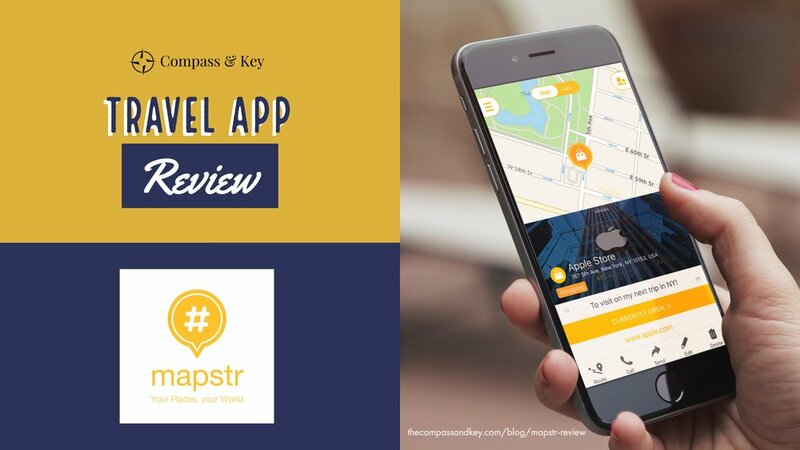 Help Your Visitors: Save your favorite hometown destinations to your map on Mapstr so that houseguests or other visitors can easily find places to go and things to do in the area. Note that the only way for someone to view your map is if they have also joined Mapstr. Essential Tags: Our primary set of custom tags include art, dining, history, hotels, market, museum, nature, shopping, and sightseeing. We have added custom tags as needed, like secret garden, bakery, and wine. Add an emoji to the end of your custom tag for some visual panache. Do you have any tips for creating a personal map for your travels? Share your ideas in the comments below. And if you've joined Mapstr and want to share your places with the Compass & Key community, include your Mapstr username in the comments.